What is Spain and Spanish culture, if not delicious food? From tapas to simple, down-to-earth family-style meals, Spanish cuisine has it all. But Spanish cuisine can’t simply be broken into one umbrella category, because the influences of ruling cultures and Spain’s mountainous terrain divide the country to reflect more regional flavours and dishes. Up until quite recently, the mountainous terrain acted as a barrier between the regions, which made both travelling and communication quite difficult. With this in mind, it’s easy to understand how the landscape of Spain divided the region and limited ingredients to what was found locally. Regions along the coast have plenty of seafood dishes to share, while further inland regional recipes will feature locally grown vegetables and legumes. 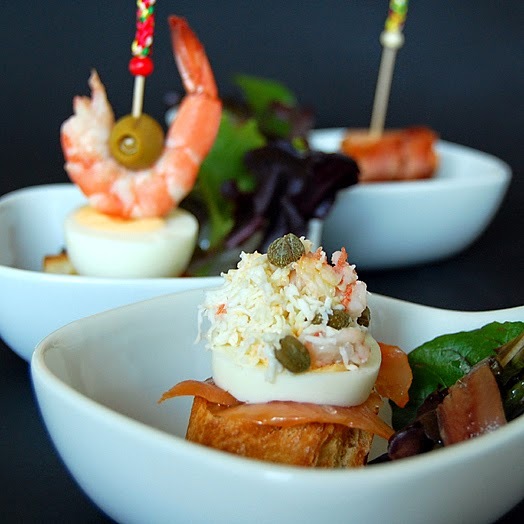 Originally, the stick that pierced the dish inspired the name of this very popular appetizer. Pintxos is an altered Basque word based off of “pinchos,” or the verb “pinchar,” which means ‘to pierce.’ Today these little delights are still called pintxos, regardless of whether or not they are actually held together by a cocktail stick. 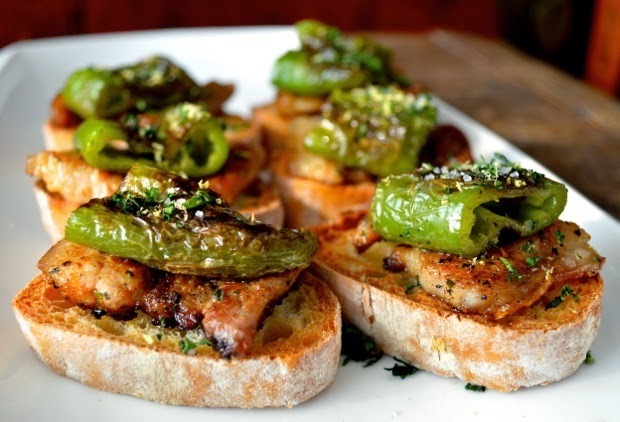 We’re serving up a trio of pintxos for your snacking delight! Two of which are Spanish, and one that contains a hint of Argentinian flare. Photo by The Woks of Life. The region of Galicia can be aptly described as cold, damp and rocky. It's no surprise that many of the regional dishes hailing from this area of the country are hearty soups and stews that are served piping hot - or at least warm enough to ward off a chill! 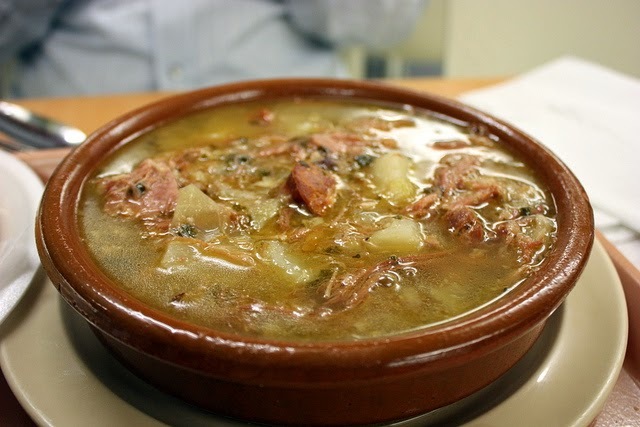 Caldo Gallego is a white bean, potato and cabbage soup that Galicians have supped on for centuries. Meat is often added to make this soup more filling. Tienda's addition of chorizo sounds like just the right balance of heat - perfect for dinner on a cold evening. How could we possible write an article about Spanish cuisine and not mention Paella? It’s impossible! This is one of the most famous Spanish recipes internationally, but we wanted to bring you a recipe that was as close to the original Valencian Paella as possible (this means no chorizo!). 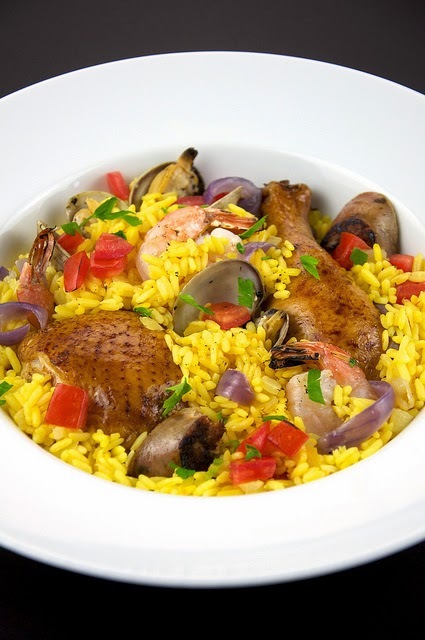 Named after the very large pan that this dish is cooked in, Paella is traditionally served family-style and very happily eaten by all those that enjoy delicious comfort food.